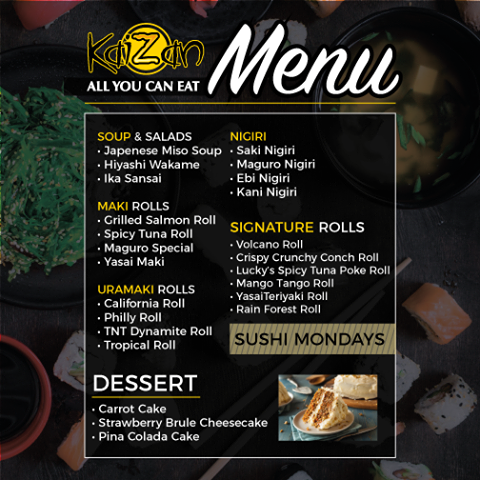 KAIZAN SUSHI (Movie Towne POS AND Price Plaza, Chaguanas) – Monday Lunch and Dinner Sushi Buffet. ($175/person tax exclusive), Soups, salads, nigiri, maki rolls, uramaki rolls, signature rolls and desserts plus a complimentary glass of wine. MovieTowne POS: (868) 222-4441 / 623-5437 Price Plaza Chaguanas: (868) 672-6601 / 672-1815. Link to the menu. MORE VINO (Woodbrook AND San Fernando, Trinidad) – Tuesday Dinner Sushi Buffet – from 6pm. ($199/person exclusive of taxes). Rolls and nigiri from the sushi station, appetisers and soup, hot food items, live pasta station and a dessert station. Woodbrook: (868) 622-8466 and San Fernando: (868) 652-8466. Weekly menu is posted on the More Vino Facebook page. CHINA PALACE (Ellerslie Plaza, Maraval, Trinidad) – Wednesday Dinner Buffet 7pm-9:30pm: ($275/person inclusive). (868) 622-5866. Link to buffet menu. ME ASIA CHINESE RESTAURANT & BAR (Long Circular Mall, St. James, Trinidad) Wednesday & Saturday Dinner Buffet : 6:3pm-9pm ($245 Wednesdays and $218 Saturdays inclusive of VAT & service charge). RESERVATION ONLY (868) 622-3949 for reservations. Link to sample menu. 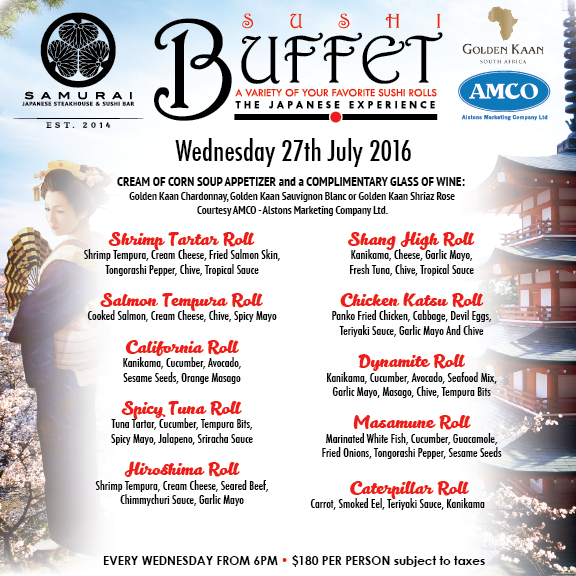 SAMURAI GRILL & SUSHI BAR (One Woodbrook Place, Woodbrook, Trinidad) Wednesday Dinner Buffet from 6pm ($195/person exclusive of taxes). (868) 289-4616 or reservations@samuraitt.com. Link to sample menu. EMPEROR’S GARDEN (formerly SING HO RESTAURANT) (Long Circular Mall (Level 5) in St. James, Trinidad) – Wednesday Buffet Dinner: 6:30pm-9:30pm ($230/person inclusive of taxes). (868) 628-2077. SOONG’S GREAT WALL (San Fernando, Trinidad) – Wednesday Dinner Buffet starts at 7pm ($300/person inclusive of taxes). (868) 652-WALL (9255). 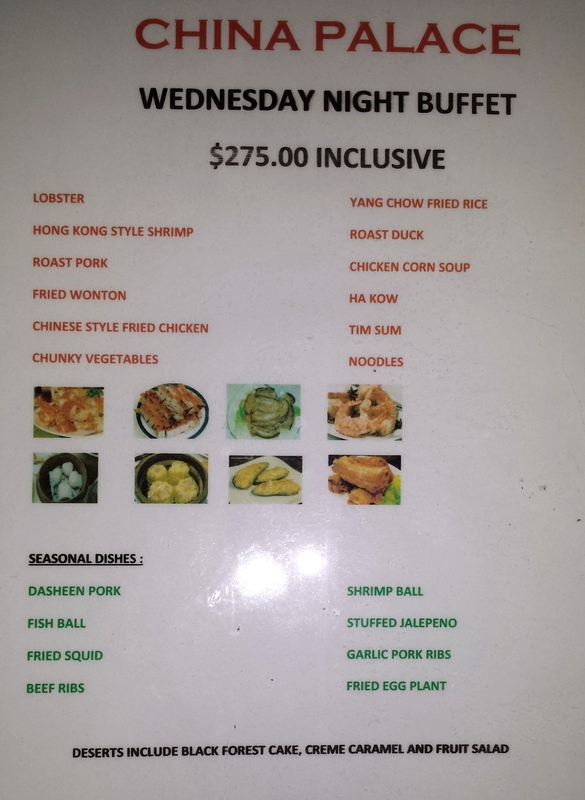 VALPARK CHINESE RESTAURANT (Valsayn, Trinidad) – Wednesday Dinner Buffet: 7pm-10:30pm ($180/person inclusive of taxes). (868) 662-4540. KRAVE RESTAURANT (Tarouba Plaza, Marabella, Trinidad) – Wednesday Dinner Italian & Seafood Buffet: ($250/person exclusive of VAT & service charge) children under 12 years old are half price and those under 5 are free. (868) 658-5728. CARNIVAL CITY ULTRA LOUNGE (San Fernando, Trinidad) – Sunday Brunch Buffet: 10am-4pm; $150 per person; children ages 6-12 half price and children under 6 years are free. Link to Carnival City’s brunch menu. (868) 223-1193. CIAO RESTAURANT at The Normandie Hotel (St. Anns, Trinidad) – Sunday Brunch Buffet: 8am to 1pm ($175 plus taxes; one child (under 6 years) free per adult). (868) 625-8732 or 627-4251 ext 5555/3005 or 463-2448; info@normandiett.com. KARIWAK VILLAGE RESTAURANT (Crown Point, Tobago) – Friday & Saturday: Buffet Dinner + Live Entertainment ($230/person inclusive of VAT & service charge). (868) 639-8442. KRAVE RESTAURANT & SUSHI LOUNGE (Marabella, Trinidad) – Sunday Brunch Buffet: 10:30am ($333/person inclusive of VAT & service charge, children under 12 are half price and those under 5 eat free). (868) 658-5728. 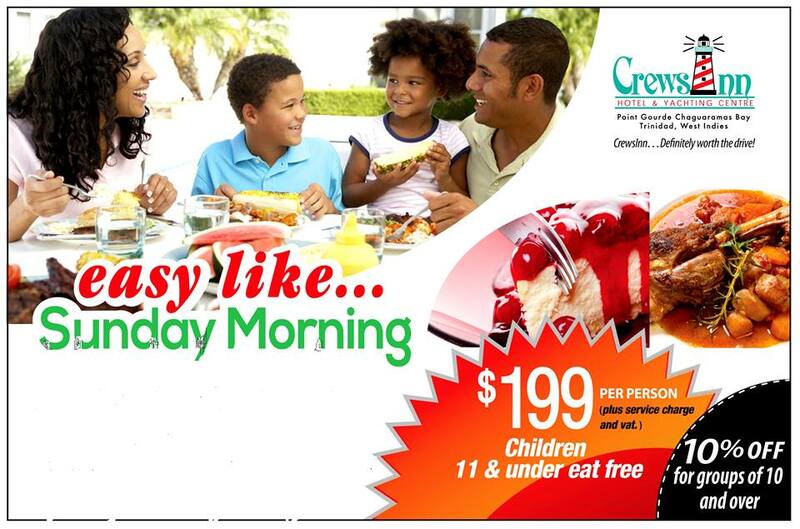 LIGHTHOUSE RESTAURANT at CrewsInn Hotel & Yachting Centre (Chaguaramas, Trinidad) – Sunday Brunch Buffet, 11:30am-3pm ($246/person inclusive of tax & service charge, children 11 & under eat free; link to flyer). (868) 634-4000. NEW RASAM (Grand Bazaar, Valsayn, Trinidad) – Friday Thai Dinner Buffet and Saturday Indian & Continental Dinner Buffet: 7pm-10pm ($225/person inclusive of tax & service charge). Children 5-11 years are half price (868) 645-0994. RITUALS CAFE (Trinidad) – Saturday Breakfast Buffet : 7:00am-1:00pm ($81.66/person exclusive of taxes) and Sunday Breakfast Buffet ($150/person exclusive of taxes) available at Maraval, Pointe-a-Pierre, Glencoe and Price Plaza. SOONG’S GREAT WALL (San Fernando, Trinidad) – Sunday Lunch Buffet, 11:00am-3/4pm. ($225/person inclusive of tax & service charge). (868) 652-WALL. TTHTI HILLTOP RESTAURANT (Chaguaramas, Trinidad) – Friday Dinner Buffet: 6:30pm-8:30pm ($200/person). Hilltop Restaurant is open during the TTHTI school terms, call to confirm opening days/times and reservations are recommended. (868) 634-2144 ext 4066/4065). VALPARK CHINESE RESTAURANT (Valsayn, Trinidad) – Sunday Brunch Buffet: 11am-2:30pm ($150/person exclusive of VAT). (868) 662-4540. WATERFRONT RESTAURANT at the Hyatt Trinidad – Sunday Brunch Buffet, 12:30pm-2:30pm ($380/person inclusive of taxes and service charge). (868) 623-2222. 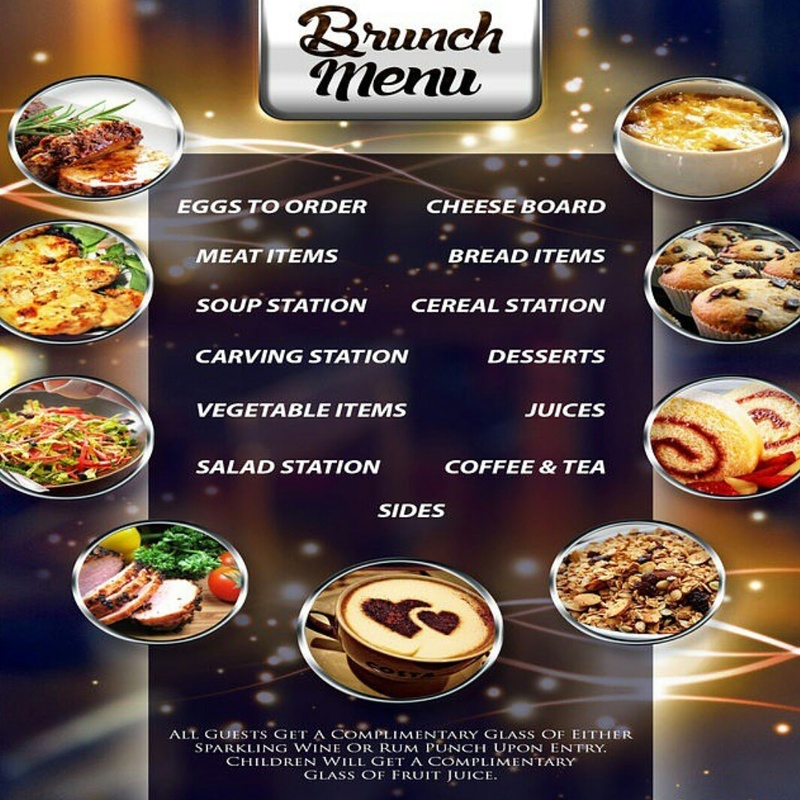 WOODFORD CAFÉ (Price Plaza, Chaguanas, Trinidad) – Sunday Brunch Buffet from 8am to midday ($150/person plus taxes). Kids eat free on Sundays at Woodford from kids menu. (868) 627-0001. ASIAN BUFFET (Trincity, Trinidad) – Daily Lunch & Dinner Buffets: LUNCH (11am-6:30pm) is $217/person inclusive of taxes & service charge; DINNER (6:30pm-10:30pm) is $321/person inclusive of taxes & service charge. (868) 640-5373. BUFFET KING (Chaguanas, Trinidad) – Daily Lunch & Dinner Buffets (over 50 items including a salad & dessert buffet): LUNCH Monday – Saturday and is $98/person; DINNER Monday – Thursday and is $140/person and Lobster Buffet is Friday & Saturday $175/person (lobster buffet is based on availability and priced per pound)..” Half price for birthday celebrants and children 5-9 years; toddlers 2-4 years $15/person.” Prices are VAT inclusive. (868) 671-8795 or (868) 672-9483. JAFFA AT THE OVAL (Port of Spain, Trinidad) – International Lunch Buffet, Monday-Friday, 11:45am-2:30pm: ($199/person + VAT and complimentary glass of wine). (868) 622-6825 or 628-6200. LA CANTINA (Port of Spain and C3-San Fernando Trinidad) – Daily Buffet, 5pm-10pm: $99/person + VAT. (868) 62-PIZZA. LIGHTHOUSE RESTAURANT at Crew’s Inn (Chaguaramas, Trinidad), Daily Breakfast Buffet, Monday -Friday, 7am-10:30am ($81/person taxes included). (868) 634-4000 ext 424/498. NAMASTE INDIA (Freeport, Trinidad) – Daily Lunch & Dinner Buffets $90/person: LUNCH (12pm-3pm); DINNER (6pm-10pm). (868) 6371-7098; 673-5569; 387-4649. Link to our Namaste India pictures. OLYMPIA RESTAURANT at the Radisson Trinidad (Port of Spain, Trinidad) Daily Lunch Buffet ($194.35/person plus taxes); Sunday Brunch Buffet 11:30am-2:30pm ($247.25/person plus taxes);with three live chef action stations including a Sunday Roast station. (868) 625-3366. PEMBOIS BUFFET at Magdalena Grand Resort (Lowlands, Tobago) – Daily Breakfast, Lunch and Dinner Buffets. Daily Breakfast Buffet 7am-10:30am ($192/person tax inclusive); Daily Lunch Buffet 12pm–3pm ($198/person tax inclusive); Daily Dinner Buffets 6:30pm-10:30pm ($341/person tax inclusive). (868) 660-8500. THE POOL TERRACE RESTAURANT at the Hilton Trinidad (Port of Spain, Trinidad): Daily Breakfast Buffet 6:30am-10:30am Monday-Friday ($218.84/person tax inclusive) and Lunch & Dinner Buffets available based upon occupancy of the hotel. (868) 624-3211. WATERFRONT RESTAURANT at the Hyatt Trinidad – Daily Breakfast Buffet 6am-10:30am (ends at 11am on weekends) ($209/person inclusive of taxes & service charge). (868) 623-2222. NOTE: Every effort is made to keep this list updated, but please call to confirm buffet days and times, menus and prices. All buffets, menus and prices along with the days & times are subject to being withdrawn or changed at the restaurant’s discretion. Also, many restaurants on this list offer reduced buffet prices and/or free meals to children depending on their age. Don’t miss our round-up of restaurants in T&T with daily lunch specials! Jaffa at the Oval might work given it’s size! Thank you, we’ll update it. The time of the Buffet at Levels is incorrect. I went last night [Oct 7th 2014] at around 6:30 and was surprised that they weren’t ready for patrons. The waiter then informed that the buffet is from 7PM-10PM. Point to note though…they stop refilling the trays of sushi at 9 PM. Thank you Gregory, we’ve updated LeVeLs’ listing. to comments but none for D Galley Restaurant @ the San Fernando Yacht Club? Is this in American dollars?? All prices listed are in $TT. Yes, all prices are in $TT. All prices are in TT dollars. Have the coconut curry prawn and naan for sure, if you do! What restaurant are you referring to A.B.? Will you all be doing a review of The New Rasam? We haven’t made it to The New Rasam yet, but hope to visit soon and share our experience!